Lal verenda (jatropha gossypifolia, family : euphorbiaceae) is a shrub with adhesive on whole body attaining a height of 1-2 m. The plant's whole body-color is reddish and its young leaves are the same. For this reason it is called Lal verenda in Bangla. Leaves are palmately compound, 3-lobbed, each 10-2 cm long, blackish red (matures are greenish), viscose, long petioled. Flower blooms in rainy season. They are small, red, clustered in terminal panicle. Sepals 5, petals 5. Immature fruit is green, yellow when ripe, 3-chambered. Propagation of the plant is caused by seeds. The plant is full of herbal qualities. Oil extracted from it is used in pain. Genus name gossypifolia means cotton-like leaves. Keshordam or Creeping water primrose (ludwigia adscendens, family: onagraceae) is a floating or creeping herb with spongy bladders at the nodes. Its stems are soft and juicy. It grows on water or on the edge of water bodies. Its a very common aquatic flowering plant in Bangladesh. In addition, it is found in the subcontinent and extending through South China and Malaysia to North Australia. Other Bangla names: Malcha, Malsi, Panidoga, Diohenchi. Stems are usually smooth but when grown on the soil it will be hairy. Leaves are shinny green, broadly oblong-elliptic, glabrous, alternate, 2.5-5 cm long, apex obtuse or rounded, veins and midrib are very clear. The flower is one of the most beautiful flowers in Bangladesh. 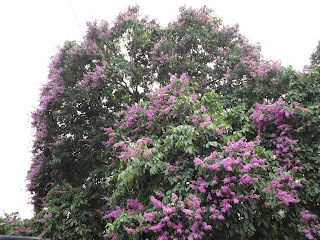 It blooms from rainy season to late autumn. Flowers are conspicuous, white with yellow eye, petals 5, obovate; sepals 5, wide open, stamens 8. Fruit is a capsule, dehiscent, Seeds are pale brown, numerous. The plant is propagated by seeds and its floating stems.